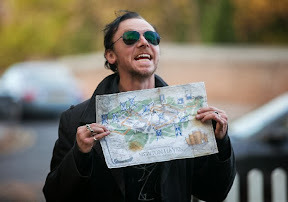 A postmodern version of an epic Arthurian quest lays just below the surface of as you like it hilarity in The World's End, the third and final installment of Edgar Wright and Simon Pegg's Three Flavors Cornetto trilogy of sorts. Wright's own junk food hangover cure he referenced along with co-writer Simon Pegg in their slacker vs. zombie cult classic Shaun of the Dead and then devoured onscreen in their Midsomer-like village set Michael Bay actioner Hot Fuzz, it's only fitting that the hangover cure come full circle for use in a film about the ultimate pub crawl. Yet just like an inebriated man with beer goggles, it's safe to say that a good many will watch The World's End drunk on the overflowing humor and only begin to peel back the layers after it's finished. 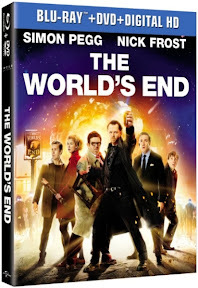 And not only do Wright and Pegg seem fine with that but they damn near count on it, building a vastly intoxicating behind-the-scenes Blu-ray experience that's almost as enjoyable as the film itself. Guiding you through every aspect of the moviemaking process in more than three hours worth of footage, the two walk you through the insanely detailed, screenplay blueprint flip-chart, pointing out all of the signs and omens audibly and visually, before giving every department and/or topic its due. With the benefit of knowledge meeting you halfway with your sense of humor already engaged -- it's safe to say that just like the film's main character, you're sure to want to go on the pub crawl a second time with fresh eyes as opposed to solely under the influence of beer (or humor) goggles. Centering the onscreen quest on a very different King than Arthur, we're introduced to Pegg's irresponsible, overgrown adolescence in arrested development Gary King, who first brings us up to speed wearing rose colored glasses. Reliving the greatest night of his life embarking on The Golden Mile pub crawl with his four best mates after graduating high school, Gary happily idealizes the past before a comment from a fellow addiction anonymous group member plants the seed of dissatisfaction in his middle-aged life. 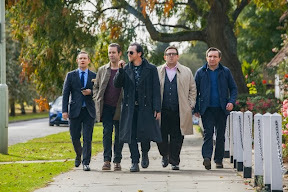 Having failed to make it to all twelve of the pubs that make up the Mile in the past, Gary sets off -- determined to get the old band back together... well, not literally since he'd sold their instruments to buy drugs ages ago and all of the other men are in respectable careers now. Manipulating each man with various tales until they bend to his will, the five knights embark not on horseback but via his vintage car nicknamed the Beast complete with a killer late '80s/early '90s mix-tape blasting away mile after mile. 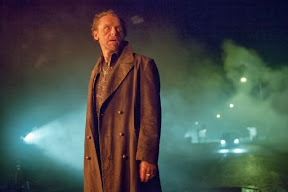 While it doesn't seem to have a lot to offer in the way of plot -- at least initially -- things start going from strange to worse shortly into their Mile journey from one Tarot-card like symbolized, ominously named pub to the next all the way through to the titular World's End. From the corporations that have taken over the pubs so that they've all begun to look the same to the bizarre behavior of the locals (moving in concert -- conformity and group-think gone haywire), our heroes begin to realize things aren't like they used to be. And even though there's always the question of whether or not you can really go home again, the widening gap between us vs. them (or the heroes vs. the "blanks" as they come to be called) come to the forefront shortly after they begin slamming down pints as embodied in an apocalyptic twist midway through the movie. 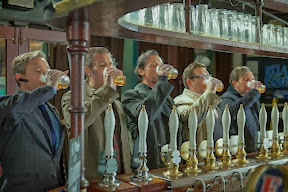 Realizing they must come together to save the town from annihilation one pub patron at a time, Gary's pub crawl takes on a far more epic meaning as he and the others struggle to make it to the final destination of The World's End alive. Actually, "blanks" turns out to be a great word as issues of any prejudice can be used to literally fill-in-the-blank if you want to read deeper into the movie (and indeed, are teased in a tongue-in-cheek conclusion as well). However, just like appreciating the humor first and the layers later, the apocalyptic comedic horror smackdown soon takes center stage over anything else, dominating your brain-space for the rest of the film. 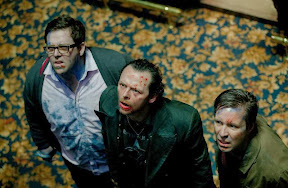 An enjoyable romp that intriguingly pays off on the previous two films as we discover the way the blanks multiplied has zombie-ish similarities and reveling in the same type of over-the-top action we witnessed in Fuzz, The World's End marks a surprisingly soulful conclusion to the trilogy-in-jest. 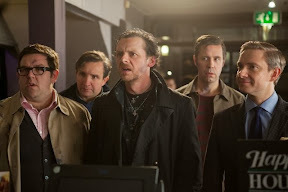 While I still have a special place in my heart for Fuzz, in a year over-crowded with topically similar movies of every genre, comically speaking it's The World's End rather than This is the End that I think I'd sooner grab hold of a second time for a night of apocalyptical hilarity ever after.